Homebrewing is an interesting and absorbing hobby which can be as simple or as complicated as you want to make it. But for a novice new to the hobby the first question is usually how do you get started home brewing? I remember having a conversation with a well known brewer and during that conversation he mentioned that if you have a bucket you can brew. That perhaps is a little bit of an over simplification but the sentiment is quite true – brewing does not have to be difficult. For many the easiest way to get started home brewing your own beer is by using a kit. The homebrew kit is the mainstay of the home brewer. I would guess that most home brewers at some stage in their brewing career have used a kit of some kind. In its simplest form a homebrew kit consists of some malt extract and yeast. It is the malt extract that provides the fermentable sugars that the yeast will ferment into alcohol during the brewing process. But what is malt extract? Malt extract is a concentrated syrup made by mashing barley malt with water to extract the sugary goodness that is present in the malted barley grain. The resultant liquid, which brewers call wort, is then concentrated by vacuum evaporation into a thick syrup. During the process hops can be added to give a hopped extract thus saving the home brewer from having to add hops. There are some excellent kits available on the market, but not all kits are the same. In general there are two types of kit that are available to the home brewer and there is some contention as to which is the best to use. The two types of kit are defined by the raw material that has been used in their production. Most home brewers would insist on using nothing but 100% malt extract, that is an extract that has only been made from malted barley. 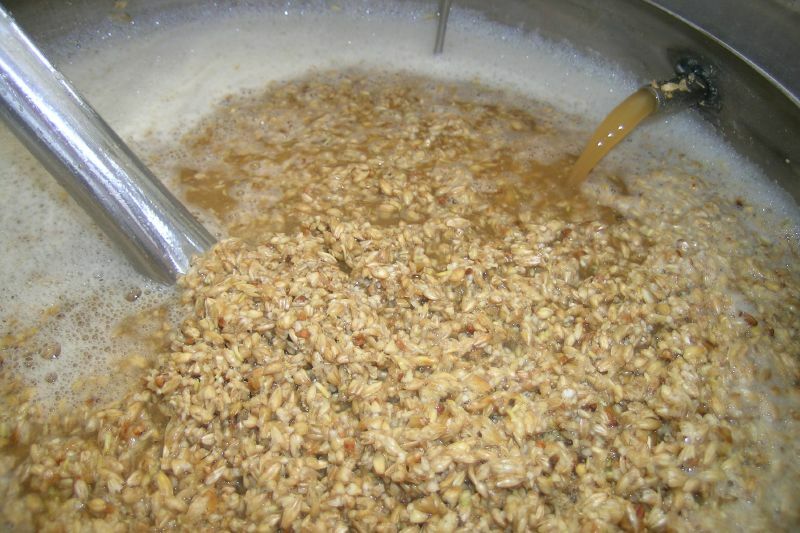 However, some kits are made from a mix of malted and unmalted barley. This makes the cost of production of the kit cheaper because barley is cheaper than malt but, if the kit manufacturer as done their job properly, the kit should perform in more or less the same way. Homebrew kits can be categorised by the weight of extract supplied usually 1.5 kg, 1.8 kg or 3.0 kg. The 1.5 and 1.8 kg kits are generally cheaper because the homebrewer has to add extra fermentable sugar, usually in the form of table sugar or spray dried malt extract. The 3.0 kg kits are more expensive but do not require the addition of sugar. For some home brewers the 3.0 kg are the best kits to use because all of the fermentable material is derived from malt so lead to, what they feel is a better more well rounded beer. For the more advanced homebrewer extract can be used as the base for their brewing as you can purchase a wide range of extracts to be able to brew anything from a lager to a stout and everything in between. 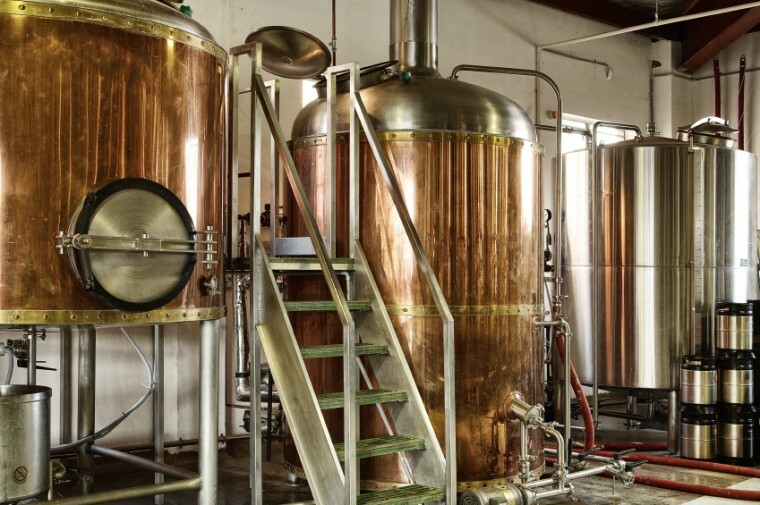 Therefore malt extract comes in various colours from a pale yellow colour, which can be used to make lagers or golden ales, through to very dark which can be used to brew porter or stouts. 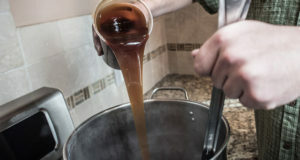 The more proficient homebrewer can therefore design their own beers by mixing and matching different malt extracts to brew different styles of beer. Furthermore if the extracts are unhopped then, by purchasing a large pot in which the diluted extract can be boiled, the home brewer can also experiment with different hops. In this way the home brewer can create some truly unique and interesting beers. However, it is often best, if new to brewing, to start with a kit that has been designed to be simply diluted with water to the correct gravity and then the yeast can be added to initiate fermentation. 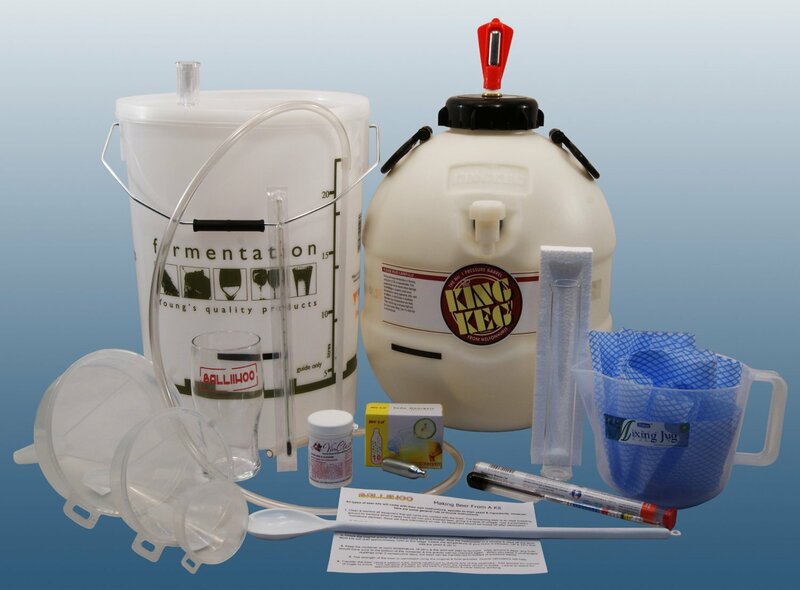 There are a number of kits on the market which have been made to match commercially available beers such as the Woodfordes or St Peters range of homebrew kits. The good thing about these kits is that they are designed for the novice home brewer so that within a few weeks you should have 35 – 40 pints of beer ready to be drunk. If you remember earlier in this article I described a conversation that I had with a brewer who said that if you have a bucket you can brew. In essence that is all you need but you can purchase specialist equipment specifically designed for the home brewer. If you are new to home brewing and you are on a tight budget then it is true that all you need is a bucket with a lid. Make sure that, if the bucket is plastic, it is made from food grade plastic. However, for a little bit more money you can buy purpose built plastic fermenters. 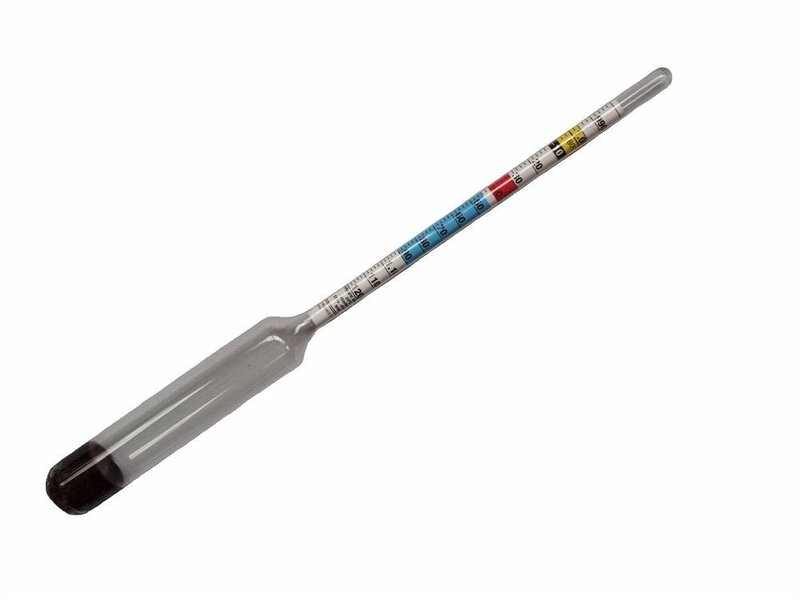 Other equipment that is useful to have if starting with an extract kit is thermometer, hydrometer, measuring cylinder, jug and a long spoon for stirring. A separate bucket for cleaning and sterilising equipment is useful and a tube for siphoning the finished beer out of the fermenter into bottles. You also will need bottles, lots of them. The average homebrew kit will make 30 – 35 pints so you will need sufficient bottles for this volume of beer. The good thing is that you can recycle bottles from beer that you buy from the supermarket rather than buying bottles specifically for home brewing. Finally lids or caps for bottling and a capping machine to secure the caps in place is needed. Fortunately for the new home brewer you can buy a home brew starter kit which has all the equipment described above, allowing you to get started at a very reasonable cost. For example the Brew Buddy Home Brew Starter Kit contains just about all you need, to get started, for under £40 which is excellent value for money. There you have it getting started on the road to home brewing your own great tasting beer couldn’t be easier. Oh yes and keep reading HomeBrewTechniques.com for more great home brewing tips. Until next time, cheers and beers! How do you Create a Brewing Recipe – Part 2: Using coloured malt.